It's true: from now on, no discussion about terroir will be complete without a reference to the video below, which is both hilarious and perfectly on-target. Tasting Dirt--True Terroir was created by Ryan O'Connell, a young American living and making wine in the Cabardès wine region of France. He and his parents own Domaine O'Vineyards, just north of the ancient walled village of Carcassonne. As a winemaker, Ryan's philosophy is to "blend the best techniques and attitudes (and drinking habits) of the new world with the refinement, wisdom and character of the old world." He's apparently doing so quite successfully, as he's had stunning reviews from people like Jancis Robinson. And he's doing it all with great humor, creating wines with names like Mediterranean Mojo (Cab-Merlot blend) and Les Amèricains (Merlot, Cab, Syrah). 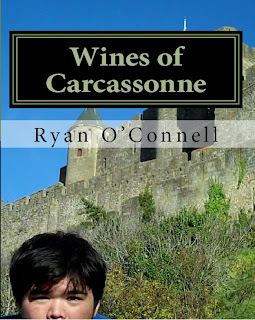 Ryan's also put together a handsome, fact- and photo-filled book, The Wines of Carcassonne; it includes a map and overview of the Cabardès, an index of that AOC's wineries, and much more. You can try to win a downloadable copy at the Wines of Carcassonne Book Contest (the odds are pretty good that you'll win). Vin de terroir vs vin d'effort... Super video! great find Suzie! I want to go there and meet him and taste the wine... which will be, as he says, a perfect balance between old world (dirt) and new world creativity (him). Now I have to go and try to win the book! Thanks, Ryan -- seems like you are doing great and FUN things. I hope to get over there sometime soon and try your wines. You're in a fairly unusual position being an American making wines in France while trying to combine the best of both traditions. And then being so technically plugged in on top of that. Here's to dirt!